Red drum are one of the most recreationally sought-after fish, especially in the South Atlantic and Gulf of Mexico. In order to better manage the fishery, scientists use passive acoustic surveys to listen for drumming sounds of male red drum, delineate spawning grounds, and determine the temporal and spatial aspects of reproduction. Image credit: USFWS. 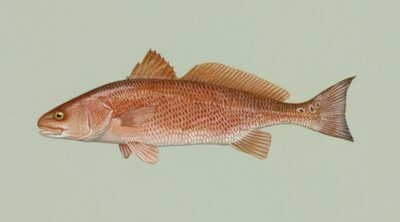 The red drum (Sciaenops ocellatus), also known as redfish, channel bass, or spottail bass, are elongate, copper-colored fish that range in Atlantic waters from Massachusetts to Florida and into the Gulf of Mexico. In addition to their copper body coloring, which fades to white on the belly, the species has distinct black spots about the size of an eye (“eyespots”) on their sides, with one, large, spot on the upper base of the caudal fin. Adult red drum typically weight 2.7-3.6 kg (6-8 lbs), and reach 71-44 cm (28-33 in) in length. Red drum feed on crabs, shrimp, and other small fish, changing their diet with the season. Immature red drum are abundant in estuarine waters and nearshore inlets, while mature fish (older than 4 years) prefer deeper waters, often in association with rocky outcroppings, including jetties, and manmade structures, such as oil rigs. Schools of adult fish migrate seasonally, moving offshore or south in the winter and inshore, or north in the spring. Mature red drum spawn in coastal waters from mid-August to mid-October, with the exact timing of spawning varying geographically. Sounds produced by male red drum are associated with courtship and spawning activity. Male red drum produce distinctive, low frequency “knock” sounds using specially developed sonic muscles to vibrate their swim bladder. The dominant fundamental frequency of these calls range from 140-160 Hz. Each call is made up of a variable number of knocks repeated at a range of pulse repetition rates. Fundamental frequency and general character of the call differs between individuals. Differences in fish size can influence pulse duration and the frequency of sounds produced. Red drum (Sciaenops ocellatus), are elongate. copper-colored fish that range in Atlantic waters from Massachusetts to Florida and into the Gulf of Mexico. The species has distinct black spots “eyespots” on their sides, with one, large, spot on the upper base of the caudal fin. Image credit: USFWS. Peak sound production during spawning occurs from dusk into the evening. An increase in both calling frequency and pulse repetition rate occurs prior to spawning. Male calls may consist of so many pulses occurring in such a short amount of time that they sound more like a drum roll or rumble. In captivity, spawning of red drum was only observed on evenings when male fish were calling, and spawning was more productive (e.g. more eggs were released by females) when the fishes produced more calls with longer durations and more pulses. Red drum are one of the most recreationally sought-after fish, especially in the South Atlantic and Gulf of Mexico. Commercial fishing for this species is restricted, as red drum have been designated a protected game fish and the commercial fishing of the species in Federal waters has been prohibited since 2007. 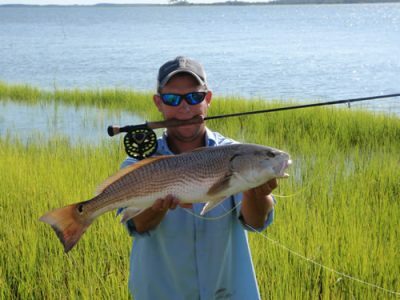 In order to properly manage red drum, it is critical to have information on their spawning habitat and reproductive behavior. Scientists use passive acoustic surveys to listen for drumming aggregations of red drum, delineate spawning grounds, and determine the temporal and spatial aspects of reproduction. Acoustic telemetry can also be used to monitor the movements of adults.